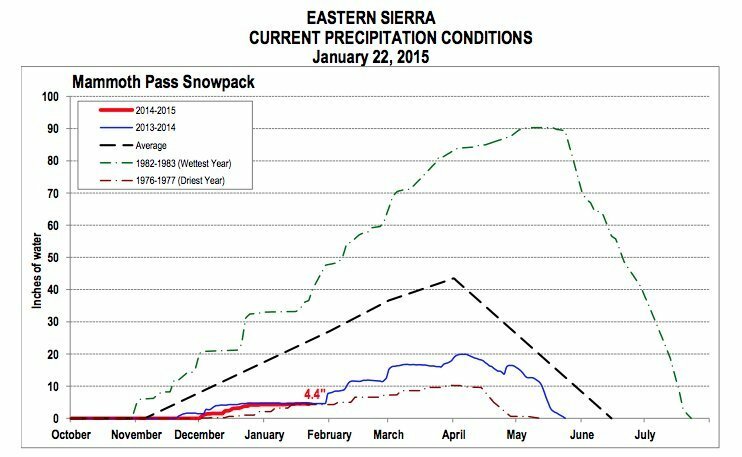 California is days away from completing what may become its driest January on record -- and a recent chart from water officials provides a grim glimpse at how low resources are at one of its most important snowpacks. Snowpack in the Eastern Sierra Nevada Mountains sits at just 4.4 inches of water, around 20 inches below average for this time of year, according to data collected by the the Los Angeles Department of Water and Power (LADWP). That snowpack is an important resource for Los Angeles. Water collected from the mountains feeds through the Los Angeles Aqueduct, one of four that flow from the north. Figueroa says the aqueduct has supplied 34 percent of the Los Angeles Basin’s water on average over the last five years. Given the snowpack’s dismal numbers, the department plans to shift resources. “Deliveries are really low, so that means we’re going to have to buy more water,” she said. The department currently purchases about half its water from the Bay Delta and the Colorado River. Snow is incredibly important to the state’s water system, and climatologists were disappointed by what little of it fell during last month’s “storm of the decade” when rains ravaged the state. In the summer months, the Los Angeles Times noted, the snowpack melts into reservoirs and accounts for about one-third of the state’s water supply. California will need more precipitation “as snow versus rain before we will see substantial changes on the U.S. Drought Monitor,” Mark Svoboda, a climatologist with the National Drought Mitigation Center, told HuffPost.